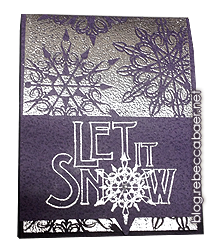 Rebecca | Let it Snow! This image-based tutorial shows the step-by-step process for creating the card shown at right. The card stock is a light silver pearl and the snowflake image and text are stamped using a clear pad then topped with silver embossing powder. The similarity of values produces a subtle effect. For more striking results substitute values that are of greater contrast. Acrylic Grid Using the grid rather than a plain acrylic block allows you to accurately align the stamps. This is especially helpful when stamping text so that does not slope. Our new grids are improved with fine lines for better visibility. Use the link above to check them out. For added security you can cut a half-moon in the card to slip over the upper edge of the gift card and hold it in place. 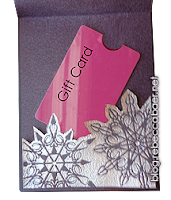 This is shown on the Plum hued version of the card below. The card fits a standard A2 envelope.